“Fastwalkers” is a term created by the North American Aerospace Defense Command to classify Unidentified Flying Objects which enter or leave the atmosphere at a great velocity and which are sometimes captured on the Defense Support Program satellite system. 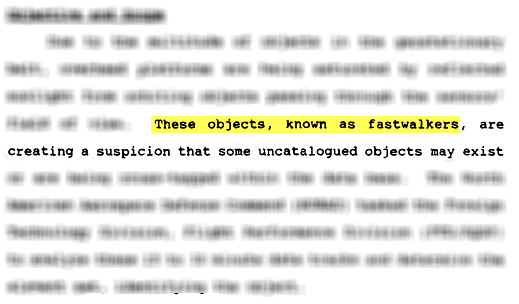 Slower anomalous objects are referred to as “Slowwalkers”. The below documents are those referencing these terms. However, subsequent FOIA requests by myself are still pending to receive more information about sightings. This page will be updated when more information is available. “FastWalker” & “Slowwalker” Regulations / Manuals / Procedures etc. 6 December 2013 Letter from NORTHCOM Regarding “Fastwalker” & “Slowwalker” regulations [1 Page, 1.02MB] – This request was worded: I respectfully request a copy of all Air Force Regulations, procedures, and manuals, either present or past, that reference “Fastwalkers” and/or “Slowwalkers.” NORTHCOM said that all NORAD material was classified. Space Based Satellite Tracking and Characterization Utilizing Non-Imaging Passive Sensors [112 Pages, 1.34MB] – March 2008 – A technique is developed to determine the orbit of a sunlight illuminated satellite passing through the field-of-view of a sensor platform in a Highly Elliptical Orbit (HEO) and Geosynchronous orbit (GEO). The technique develops two different methods of initial orbit determination. The first relies on the Gauss initial orbit determination method to develop an estimate of the state from angular data. The second method relies on positional data of the target relative to the Earth’s background to determine an estimate of the state. These estimates are then refined in a non-linear least squares routine. This estimate of the state is then used to identify the target from the Air Force Space Command satellite catalog.